Re-usable. Just like the new material, used ComposiMold can be re-melted dozens of times. Filtered but still may contain small particles (less than 1mm). Sold in cube form for ease of handling. Melt the ComposiMold in any microwave safe container. Used ComposiMold is Not for the Food Contact Molds. Supply of used ComposiMold is limited. Most of the used material in stock has not been used at all and is from spills during production. Used ComposiMold is a combination of Flex, Original, and Firm. It typically has a firmness similar to the Original. For more information please visit http://www.composimold.com If you have any questions please leave a comment or email us at info@compoismold.com Learn how create your own concrete rocks for building rock walls, fire pits, decorative piece and more! The video starts with an explanation of the mold box. The mold box was build by using plywood plastic and cardboard. The rocks are laid out so that their height are as even as possible. It is a good idea to spray or brush mold release onto the rocks. Most mold releases work with ComposiMold just don’t over do it. Using too much mold release will cause undesirable lines and marks in the mold. 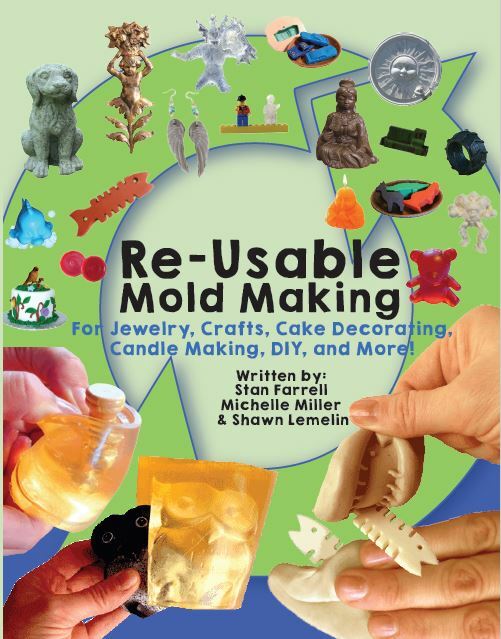 Some examples of mold release that can be used are vegetable oil, WD40, Vaseline, and silicone mold release. Once the mold release has been applied it is recommended but not required for a medium coat of bubble buster to be sprayed. Bubble buster is an easy method to reduce bubbles. It works by breaking the surface tension and allowing bubbles to rise rather than sticking to objects. When the rocks are wet with bubble buster it is a good time to pour the ComposiMold. For this project I used a double boiler to melt the ComposiMold, and I poured in increments because the double boiler couldn’t hold enough material. When pouring in layers the melted composimold will melt and fuse into the layer that has already been poured. Be carful when handling ComposiMold because it will be hot, gloves should be worn. Once all the ComposiMold has been poured it is time to wait for it to solidify. I waited overnight before removing the rocks from the mold. ComposiMolds cure time will vary depending on the mold size and room temperature. This mold was 75lbs of ComposiMold and the room temperature was 50-60 degrees overnight. While removing the rocks I did a lot of trimming to reduce the undercuts, ComposiMold can be easily trimmed with a knife or scissors. Because ComposiMold is re-usable the pieces cut of the mold should be saved and re- used when needed. Once the rocks are removed the mold can be prepared for the cement. Vegetable oil mold release works great with cement and a thin even layer should be applied to the mold. Other mold releases that work well with cement include WD40 silicone mold release and others. I used ProFinish 5000 by quickrete because it works great with ComposiMold and cures fast. Other concrete and cement mixes will work as well. Ideally you want a concrete mix that needs very little water and has a fast cure time. just make sure it doesn’t create too much heat if it does keep your mold cold! When molding large parts like the one in this video it is a good idea to use Rebar or a metal mesh to increase the strength of the piece. After pouring the concrete it needs to be smoothed out. The easiest way to even out the concretet to remove voids and air pockets is to pat the concrete with your hands, kicked The mold and shake the mold. For even better results set the mold on a vibrating table for a few minutes The next step after the concrete has been poured and smoothed out is to wait. This piece was removed after 8hours and looks great! For a smoother texture a concrete mix with less rocks should be used or add sand to a cement mix. A cement mix that works well with ComposiMold is Quikrete Masonry Cement Type N.
Same material for less Thank you! I've purchased new and used ComposiMold and they both get the same job done. Awesome product! Thank you for saving me money!